This sign stands in Kennedy Park, Eyre Square, Galway. As I passed, it cried out to be criticised, and who am I to yield right of wail? First: Why write The playing of football instead of simply Playing football? If it was an attempt to sound more authoritative, it failed: it sounds awkward and turgid, exemplifying what Ernest Gowers called abstractitis. This condition is widespread and habit-forming, and it looks bad on municipal signs, which ought to convey information plainly and unfussily. Entry into this building is prohibited. In the interest of security your co-operation in complying with this order is requested. The deceleration of your vehicle is mandatory. In the interest of children’s lives your co-operation in complying with this order is requested. The taking of walks on this grass is prohibited. In the interest of – oh, we don’t know why. But your co-operation in complying with this order is requested. The playing of football on this green area is prohibited. In the interest of the public your co-operation in complying with this order is requested. Playing football on this green area is prohibited in the interest of the public. No football in this park. Whether or not the public agree with the decree, they are likely to appreciate being addressed directly and not having their time wasted by logorrhoeic fudge. This entry was posted on Friday, August 7th, 2009 at 4:22 pm and is filed under gobbledygook, signs. You can follow any responses to this entry through the RSS 2.0 feed. You can leave a response, or trackback from your own site. Qui ne sait se borner, ne sut jamais écrire. Saw that Slow seniors again today. Had the same reaction. Although I totally agree with you that brevity should be practiced on municipal signs, I would appreciate a bit of logorrhoeic fudge on that one. What do you think of Slow down. Seniors are crossing. Courteous, and to the point. I might call the Mayor…..
Claudia: Dans ce cas, je pense que le bon conseil de M Boileau est tout à fait approprié: ça pourrait dissuader les coupables de propager du charabia! Your reaction to the “Slow seniors” sign made me laugh. What is most conspicuously missing in most signs is basic punctuation. If you’re lucky you’ll get a full stop at the end. Even commas and hyphens are rare, and anything more complicated is virtually non-existent. A colon would bring instant sense to such a sign: “Slow: Seniors” (or “Slow: Children”) without implying anything derogatory. “Slow down. Seniors are crossing.” would be okay too, though perhaps a little too specific. Motorists should slow down if children or seniors are walking along the footpath, playing, idling nearby with no intention of crossing, etc. I would also prefer “Slow” to “Slow down” because motorists already moving very slowly might not need to slow down, and motorists moving at 140 km/h might slow down to 135 km/h and feel they have obeyed the sign. Whatever your conclusions, let me know if you call the Mayor! Or why not a football with a line drawn through it; no words at all? Perhaps it’s like the Slow Food movement – a Slow Sign movement. I’m always entertained by the tautology in ‘No Parking – By Order’ signs. Mise: That’s the best idea yet, at least as regards getting the message across. Such a symbol would be simple, direct, and immune to gobbledegook. On the other hand it could prompt outbreaks of rugby, but the original sign says nothing about that either. “By Order” signs entertain me too. It’s as though the organisations in question feel that we don’t or might not take their authority seriously enough, so they have to emphasise it somehow. “Take us seriously,” they bluster. But without a basic command of punctuation, this strategy can backfire. Long may the entertainment continue! That is some mangled language. 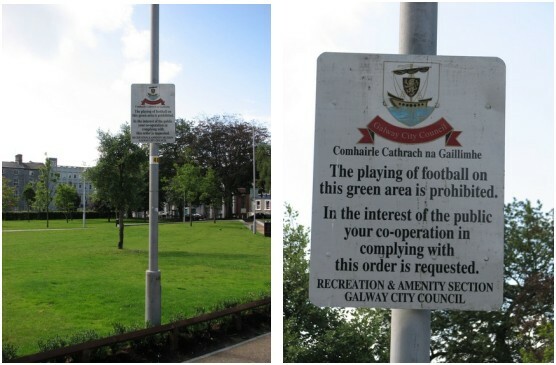 What amuses me is “Recreation and Amenity Section, Galway City Council.” Presumably the amenity staff within the section won out over the recreation staff in this case. That last sentence, however, really confuses matters and perhaps was added by a frustrated recreation officer. It softens the prohibition, first into an order and then a request. It also brings up the idea of public interest, which would probably be better served by recreation, even in the form of football. All of that aside – I would favour two words – “No Football.” I think everything else is superfluous. Kieran: Thanks for your insights. Yes, it is ironic that the Recreation and Amenity Section are coming down heavy on recreation, and in the public interest, no less. The green in Eyre Square has long been a popular spot for frisbee-throwing, juggling, general giddiness, and impromptu kickabouts with multinational teams, and jumpers for goalposts. A request for consideration when playing might have been more constructive. Or directions to an alternative venue if the green happened to be too busy for football. The wording on the sign really is all over the place, syntactically, semantically and otherwise. I’ve an idea they’re asking adults to intervene if they see children playing football there, or some such thing. The two injunctions are directed at different groups of people. It could still be simpified, though. Or better still, removed, as the banning of football was probably a reflex by some embittered council hack who always got picked last at breaktime. CIngram: There could be something to that, but it’s difficult to tell. I see more adults than children playing football in Kennedy Park.